Fig.1: A Postulant about to be invested into the Order, whereby, historical traditions remain intact in the Order. As a Christian Order of Chivalry, membership of the Order of Saint Lazarus is open to both men and women who are practicing and committed Christians, are of good character and standing in their community, and who wish to help alleviate the suffering mankind. Interested prospective members must apply through the commandery nearest their place of residence, OR through the national chancery office. (See "Our Locations" tab for email addresses and contact information). As a military Order, Saint Lazarus has a rank structure that conforms with European chivalric custom, and decorations (medals) to note service or achievement. All promotions require approval of the Grand Master. Promotions are won by achievement. This means that active, involved Members enjoy promotions up through the ranks, with the ultimate achievement of Knighthood or Dame as an honor bestowed by the Order upon those who selflessly serve Christendom. Besides promotions, members may also be decorated for achievement or merit known as the Awards of Companionnate. There are non-Christians, especially those of the Jewish and Muslim faiths, who support the aims and good works of the Order. Such members may be granted associated membership, and even promotion, through the ranks of merit that parallel the active rank structure of the Order in conformance with European chivalric custom and tradition. 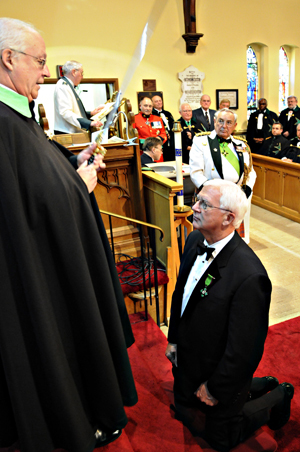 Membership in the Order is truly a lifelong commitment, and should not be taken lightly. We are a working Order, and we have many things to accomplish. It should be noted that the Order of Saint Lazarus is truly noble in that 100% of all its charitable donations go to charity. Most of the Orders administration is accomplished by its Members who volunteer their times and skills, and resources, all in the spirit of preserving the Order's money for its charitable aims and obligations. So, charity given to the Order in every way truly goes to Charity. a cheque in the amount of the admission fee to the Order (this will be returned if the applicant is not accepted). The prospective applicant will be invited to attend a personal interview hosted by at least two Knights or Dames of the Order who will explain the obligations and responsibilities of membership. the one-time passage and insignia fees assessed for postulants (new members). Following the interview, should it be mutually agreed by the applicant and the local interview team to proceed through the application process, the completed documents (accompanied by the membership application fee) will be forwarded to the National Membership Council for review. Following acceptance of the National Membership Council, the application will be forwarded to the International Magistry for approval by the Grand Master. The membership application fee will be held at the national chancery and will not be processed until the final approval of the Grand Master has been received. Should a membership application be denied the membership application fee will be returned in full. Within three years of membership acceptance postulants will be required to attend at a national Chapter General to participate in the time honoured Vigil service followed by Investiture into the Order. promote and practice the time tested ideals of chivalry. If you would like more information on becoming a member of the Order of Saint Lazarus please go to the "Our Locations" section of the website and contact the commandery nearest your location or our Chancery office via email with: . For more information pertaining to membership with the Acadia Commandery, email with: .